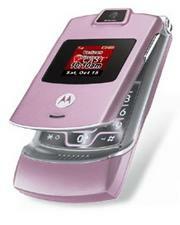 Verizon Wireless last week launched a pink version of the Motorola RAZR V3c. The pink V3c is a lot more mellow than the magenta colored V3 that T-Mobile USA stocks. The Motorola RARZ V3c in Pink is available now for $249.99 with a 2-year service contract. Motorola is expected to launch the RAZR in more color schemes, but we haven't heard exactly what colors.